We at Netshield are natural-born problem solvers so when Durban harbours needed a solution that would reduce congestion in the harbours due to the time it took for customs officials to preclear the goods onboard once ships had docked, we set to work. 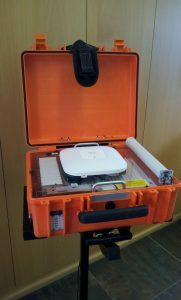 What we came up with was our SHEQ compliant APN Case, a portable Wi-Fi solution, weighing less than 9kg, which can extend an existing Local Area Network (LAN) with a line of site up to 6 km from the existing LAN infrastructure. What this solution accomplished for Durban harbours was that customs officials could be flown out to ships with the APN Case before they docked, so that all goods were precleared by the time they reached the harbour and thus it reduced harbour congestion. 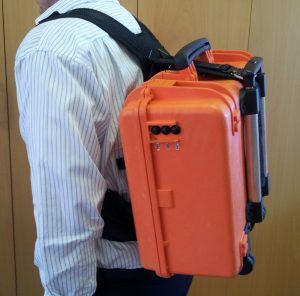 The APN Case is battery operated with 13 hours of continuous operation between charges and comes in a ruggedised water and dust proof carry case, with a trolley attachment and backpack harness, making it easy to carry and even wear. It is a quick to deploy system that incorporates a wireless access point, licensed band uplink radio, local LAN port and a GSM-based out of band management and tracking module. The Wi-Fi AP, LAN Point and Uplink Radios are interconnected inside the portable case to create a remote LAN using a single point to multi-uplink to a High-Site connected to the back of your office network that runs required app software and security to access critical information and process it accordingly. The APN Case is particularly well-suited for applications in harsh South African working environments like mines, construction sites or remote sites in the desert or bush, but it can also be applied with fantastic results on university campuses, conferences, concerts or anywhere where there is a remote building or user that desperately needs a network connection. You can definitely rely the Netshield APN Case to extend your LAN to those hard to reach places.